Klaus Wagger grew up in the Austrian Tirol, surrounded by mountains, cows and a surprisingly active motorsport scene which included F1 drivers Gerhard Berger, Karl Wendlinger and local hero Franz Albert who always seemed to run the noisiest and most exotic cars, leaving a deep impression on the small kid. From drawing cars in his school exercise books he graduated to a degree in Industrial Design and a freelance career as designer and technical illustrator. As a compensation for the endless fiddling with details he kept up painting racecars in his spare time and to make good use of it entered a competition to design a poster for the Mille Miglia in 2000. 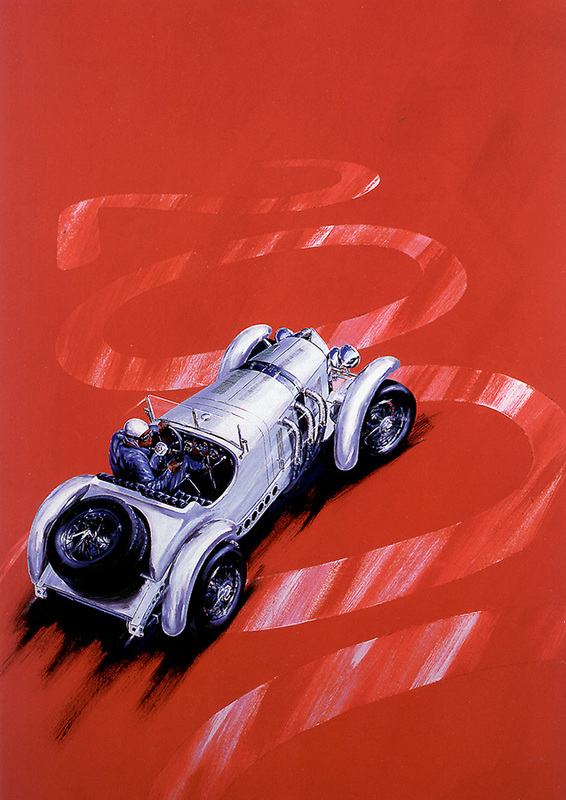 His spectacular study of an Mercedes SSK in full flight took first prize, and Wagger’s work has since featured several times for the promotion of prestigious Italian events. He has also staged exhibitions in Brescia where the Mille Miglia traditionally starts and finishes. But it was at the Retromobile in Paris that his painting career really took off. Motoring art has always been a strong feature of this premier French show and in 2002 Wagger’s bold style and vibrant brushwork were the talk of the show. Retromobile has been the mainstay of his exhibition schedule ever since, although he has added places like Goodwood Revival, Festival of Speed and Techno Classica to that list over the years. Being voted into the prestigious Automotive Fine Arts Society in 2013 also makes him a regular exhibitor at the Pebble Beach Concours and at Amelia Island. 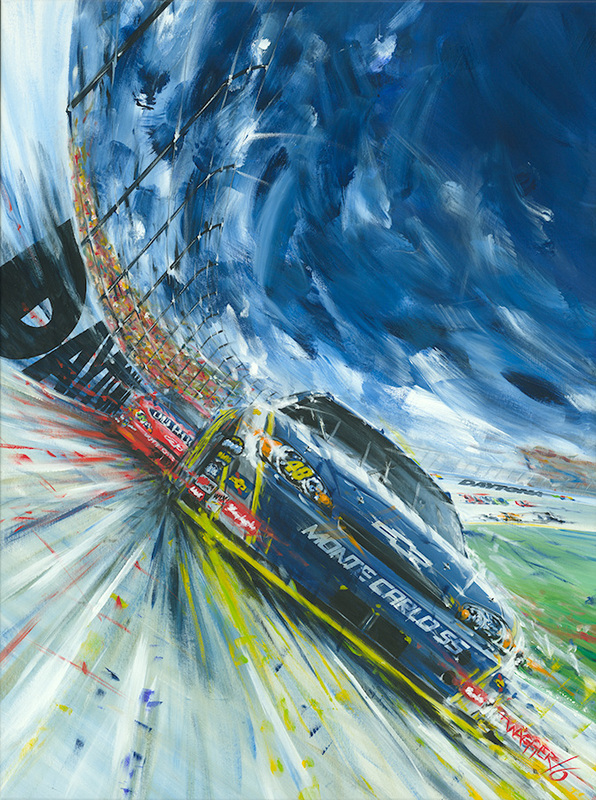 A contact through an Austrian Lotus collector unexpectetly led to him being commissioned to paint the poster art for the 2007 Daytona 500. He also rates the 2006 calendar he painted for the Carabinieri in Italy and the whole cultural experience that went with it, as one of his personal highlights. Realistic backgrounds don’t interest Wagger as he prefers to employ bold abstract tones that focus on the main subject capturing the drama of the car, the noise and the speed. He also doesn’t like to sketch out compositions too much, as he feels it restricts the expressive route and the fresh approach. He prefers to put the background colours in quickly to set the mood, and then see the painting develop, surprises included.